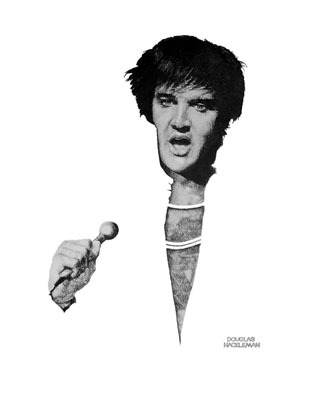 This portrait of Elvis Presley is from the time of his early appearances at the Las Vegas Hilton in 1969, and is based on a composite of three different Elvis photographs. A decade later, using a 6-B pencil, the artist rendered the charismatic singer at the heighth of his musical impact. When the artist discovered that the Las Vegas casino gift shops of the late 1970s were mostly owned by one businessman in Los Angeles, his attempt to market framed copies of the 200 lithographs he had printed came to an end. With the advantage of the internet, the artist is making these 39-year-old signed prints of the touring Elvis available for $69 each. XXXXXX PRINT DIMENSIONS: 19" x 25 "